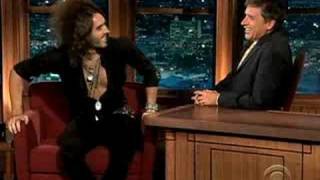 Born in Grays, Essex, to Barbara and Ron, Russell Brand was brought up by his mother. He made his theatrical debut aged 15 in a school production of Bugsy Malone, before going to the Italia Conti stage school and then the Drama Centre in Camden where, at night, he began performing stand-up. He reached the final of the Hackney Empire New Act Of The Year competition in 2000, and soon after landed two MTV series, Dance Floor Chart and Select. However he became addicted to heroin, which affected his work. and was fired after coming to work dressed as Osama Bin Laden immediately after the September 11, 2001 attacks. In 2002, he fronted the provocative Re:Brand, on UK Play in which he masturbated a gay man and challenged his own father to a boxing match to settle old schools. That year he also appeared in theSteve Coogan vehicle Cruise of the Gods – though he was thrown off the set for bad behaviour and his agent, John Noel, forced him into rehab. In summer 2004, Brand was given a second chance, hosting E4’s live Big Brother discussion series Efourum. The gamble paid of for Channel 4, and Brand was on the road to becoming an international star. The only blip on his rise came in October 2008 when, on a radio show with Jonathan Ross, Brand left filthy messages on the answerphone of Andrew Sachs, which caused huge controversy for he BBC. Sorry. We have no listings of forthcoming performances by Russell Brand. We do not currently hold contact details for Russell Brand's agent. If you are a comic or agent wanting your details to appear on Chortle, click here.